I think I've found the perfect container for herbs and spices in the kitchen. 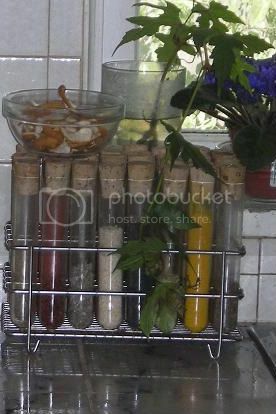 I'm not sure how long I've used the test tubes for my spices but it is the perfect storage for having the herbs and spices close at hand. It uses a small footprint on the kitchen countertop but yet it holds 32 different herbs and spices. To keep things organized, I stick a small round sticker on top with the name of the contents and then alphabetize them. It holds mostly spices and seeds (sesame -- both white and black and poppy) for most of my herbs are from the garden. However, there are a few dried herbs in the tubes. It is amazing that usually the tubes hold one of the little jars of spices and so I don't have to worry about finding a place to store half jars of things. I find that most of the tubes are emptied more than one time per year but every spring, I do "clean house" and replace anything that is old for spices, especially, loose a lot of potency when they are too old. Martha, this is a great idea. Send it to Cook's Illustrated. They have a tips from our readers section and this would be a natural inclusion. I was so excited to find your blog via Becky's! I can't wait to scroll through and read your posts! One of these days I will visit Linderhof! I love the test tube idea. Genius! !